Houghton Mifflin Harcourt, 9780618951888, 352pp. This comprehensive guide treats every species of wild mammal found north of the Mexican border, from squirrels and chipmunks to grizzly bears and jaguars as well as those in offshore waters. More than 1,200 photographs have been digitally edited to show correct sizes, comparative colors, and the field marks necessary for identification in the wild. With each title in the distinguished Kaufman Field Guide series, Kenn Kaufman engages and educates naturalists of all ages and skill levels about the wonders of nature. 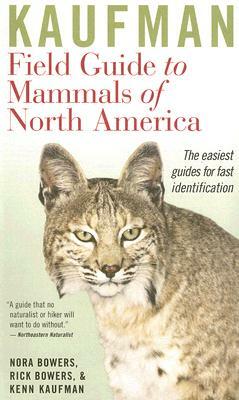 In Mammals of North America, the format has been designed for easy field use, with illustrations, maps, and text arranged side by side. Detailed range maps show where each species is common or rare. The authoritative text discusses the identification of these animals and the essential facts about their habitats and behavior. Hundreds of illustrations show tracks, dens, and other signs that we may notice even when the animals themselves are out of sight.